Furthermore, there is solid evidence that NAC helps boost the body’s levels of glutathione, one of the main antioxidants produced by the body. In particular, glutathione is critical to liver health. Many people suffer from elevated homocysteine levels, an amino acid that is a risk factor for cardiovascular disease. Several studies indicate that NAC can significantly lower homocysteine levels. Finally, if you sometimes drink alcohol and get a hangover, you’ll be interested to know that NAC plus vitamin B1 (thiamine) may help the body reduce the severity of hangovers. There are many other lesser known uses for NAC. I’ll discuss more of these at the end of the article. NAC is often sold in capsule form containing 600 mg per capsule, but the bulk powder form of the supplement can be much less expensive. NAC is also the primary ingredient in some pharmaceutical products including a product called Mucomyst that is used to treat mucus build-up by inhalation of a sterile liquid solution of NAC. 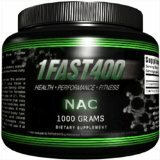 This article reviews the 1Fast400 N-Acetyl-Cysteine, NAC sold in bulk powder form. It is priced less than 1/2 the price of the 600 mg capsules from inexpensive reputable makers such as Puritan’s Pride and NOW Foods. Thus the bulk powder form of NAC is a good choice for people who use large quantities of it. Such people might include those with families with several people who use it for general health, immune system boosting, detoxification from mercury and heavy metals, and especially people who use it for mental health care applications similar to clinical testing being done with dosages of 2000 mg per day or more. I believe my nutritional supplement program helps my health, but it is unfortunately not cheap. While it would be nice if money was no object, I’m not wealthy enough for that to be true. Therefore I would like to save on my nutritional supplements where I can, especially if I can get the same effect for less money. In pursuit of better value for the dollar, in September 2009 I bought a 1000 gram (1 kilogram) container of 1Fast400 N-Acetyl-Cysteine, NAC Powder, 1000-Grams . Given how I use NAC, this represents more than a year supply for me. As a result, you’ll need to learn some about NAC to know how to use this product. This review should contain everything you need to know as an introduction to NAC plus links to some other sources of information on it. The content of the 1FAST400 NAC container is a white crystalline powder. Putting a 1/4 teaspoon into a couple ounces of Kirkland (Costco) brand bottled water, I observed that the NAC powder sinks in water quickly. It mixes well with a spoon, but simply spinning it around in a cup without spoon stirring doesn’t fully dissolve it. But even without spoon stirring, it didn’t appear to clump up in the container or the water. Before it is fully dissolved, you’ll see some white powder at the bottom of the cup. Once it is fully mixed, the resulting liquid is clear and colorless. The taste of the resulting liquid is neither strong nor unpleasant at a bit more than 1/4 teaspoon (about 1000 mg) dissolved in about two ounces water. It is just a bit tangy, some or even many people might think it tastes good at this concentration and might not even notice the taste if it were dissolved in larger amounts of water or other drinks. The plain NAC powder itself tastes tangy, but not extremely so. This is unlike supplements such as magnesium citrate, a supplement I personally use on a regular basis. When opened, the NAC powder in the container has a very slight sulfur scent. Another person I asked to sample my container of NAC reported no apparent scent and a similar perception of mild tangy flavor of the straight unmixed powder. The slight sulfur smell makes sense given that the amino acid contains sulfur, one of relatively few nutritional supplements to do so. Another major one containing sulfur is chondroitin sulfate. Sulfur is necessary to human biology is small quantities, so skip over any “fire and brimstone” and “rotten eggs” thoughts that may cross your mind about it. I’m pleasantly surprised that the taste of at least this particular brand of bulk powder actually isn’t as bad as reported in an amino acid tast chart. Given the very simple formulation of NAC, this probably has more to do with personal opinion and how it was mixed than the actual brand used. If you haven’t used bulk powder supplements in the past, this taste is not likely to scare you aware from them. If you have, especially some of the beneficial ones like acetyl L-carnitine that quite simply taste fairly awful dissolved on their own, I’d be shocked if you find the taste of NAC to be objectionable. I myself have used NAC for about two years usually at dosages between 600 mg to 1200 mg per day on a regular basis and peaking at 2400 mg per day for up to a few weeks at a time. Until recently, I was using NAC 600 mg capsules as I was unaware of the availability of NAC in less expensive bulk powder form until a few months ago. My main usage is antioxidant and immune system boosting and general detoxification as I used to have mercury dental fillings until earlier this year when I had them removed. Blood tests I had done earlier this year, several months after my fillings were removed, confirm that I have no measurable mercury. On the few occasions when I take acetominophen, I always take some extra NAC to protect my liver and kidneys. When I get a cold or flu, I often boost the NAC to three or four capsules per day (1800 mg to 2400 mg) until a few days after the infection is resolved. To date, I’ve had no adverse effects or complications from my usage of NAC. You’re probably asking “does NAC work?” Honestly, I can’t say it does or does not from my personal experience. I don’t have any acute or chronic medical condition which could improve or worsen that would obviously and easily be tied to NAC. I’m not going to poison myself with a Tylenol overdose to prove to myself that NAC can save my life. Anecdotally, it does appear that since I started taking NAC and silymarin (milk thistle) that my liver function tests such as AST and ALT have improved markedly. While it makes sense that NAC and silymarin could do this, it could be due to other factors entirely. Maybe I had some undetected liver infection that cleared up. Maybe improving cholesterol levels that I attribute to other supplements such as fish oil and niacin (vitamin B3 in nicotinic acid form) got rid of some excess fat in my liver and now it is working better. (Fatty liver disease is a common health problem that often goes undiagnosed unless you happen to get ultrasounds of your internal organs for some unrelated reason or your liver outright fails as shown by really bad liver function test results and/or severe related health complications.) Maybe it is a combination of all of these. I really don’t know, but wish I did because I could save a lot of money on supplements if I knew exactly which ones work for me right now and which ones don’t. Unfortunately, I am left with simply taking best guesses and making cost/benefit trade-offs based upon what I’ve learned about myself, my health, nutrition, and medicine. For most common uses of NAC besides acetominophen detoxification which can save lives quickly with little chance of confusion as to the cause and effect, I expect the results from NAC supplementation are largely going to be in the subtle and/or long-term effect categories. Such supplements are still overall worthwhile in my opinion so long as the cost can be kept down to an affordable level. Please see my article Do Nutritional Supplements Really Work? for further thoughts on why determining the efficacy and value of nutritional supplements is so challenging and how this impacts my personal choices about supplements, tests, and health care. NAC at high dosages is less likely to result in complications when vitamin C and vitamin B6 supplements are taken concurrently. The guidelines are generally to take about 2 to 3 times the amount of vitamin C as NAC consumed and up to 200 mg per day of vitamin B6. You should also take a multivitamin that includes some selenium and molybdenum as increased glutathione production will tend to use more of those minerals, but don’t overdo it as high selenium consumption over 400 mcg (micrograms) per day carries an increased risk of selenium toxicity. Some research claims that vitamins C and B6 both help prevent an uncommon condition in which NAC can cause increased risk kidney stones which can be very painful. Furthermore, NAC increases the body’s usage of vitamin B6. Other research cautions, however, that taking more than 1000 mg/day of vitamin C could increase risk for kidney stones by 41% versus consuming less than the US RDA of 90 mg/day of vitamin C. On balance, I’d err on the side of taking more vitamin C than the US RDA whether or not you’re going to be taking NAC as the side effects of too much vitamin C are not toxic as explained below. For most people using 600 mg or 1200 mg per day of NAC, taking 2000 mg of vitamin C spread over multiple doses per day is probably easy to tolerate. But at high dosages, vitamin C can cause uncomfortable digestive tract conditions including loose bowels and even diarrhea. I personally have taken up to 6000 mg per day of water-soluble vitamin C plus 1000 mg of fat-soluble ascorbyl palmitate plus about 170 mg per day of vitamin B6 as mix of the pyridoxine hydrochloride (70 mg) and pyridoxal 5 phosphate (100 mg) forms of vitamin B6, but generally take around 5000 mg of water soluble vitamin C and 500mg of ascorbyl palmitate. Even at the total amount of 7000 mg per day, I did not notice any digestive problems from the vitamin C. Still, I think this level is overkill despite the admonitions of some to take as much vitamin C as you can so I backed off some to a lower level that is still between two and three times as much vitamin C as the peak amount of NAC I take even when ill. The Linus Pauling Institute (LPI), named for the famous biochemist who interestingly advocated consuming large quantities of vitamin C, advises in this discussion of vitamin C safety that there is no evidence for any adverse health effects for vitamin C consumption less than 10,000 mg per day aside from digestive tract disturbances that are generally mild and rapidly corrected by reducing the ingested amounts of vitamin C. An “upper limit” for vitamin C consumption was set at 2000 mg per day for adults, but then again this is by the same government “scientists” that have repeatedly set the RDA levels for many nutrients (vitamin C included) far too low. LPI argues in its position paper The New Recommendations for Dietary Antioxidants: A Response and Position Statement by the Linus Pauling Institute that the RDA for vitamin C is still set too low and should be raised to at least 120 mg/day, that there is significant evidence 500 mg/day has beneficial effects for lowering blood pressure by relaxing blood vessels, and that the government-specified upper limit of 2000 mg/day is unwarranted and unreasonable. Given this overall inconsistent data, I’d suggest taking at least 500 mg of vitamin C if you are not taking NAC, 1000 mg per day of vitamin C if you are using NAC, and trying 2000 mg per day and increasing it by 1000 mg per day up to 8000 mg per day or until you find that you get digestive tract disturbances. Then back off 2000 mg per day from that level and see how you do for a week or so and back off 1000 mg per day every couple of days until you don’t feel any digestive discomfort. I used to take pyridoxine (the most common form of vitamin B6 in supplements) plus 50mg daily of the pyridoxamine form of vitamin B6 as it shows promise for reducing glycation (cross-linking of sugars with proteins). Unfortunately, as I mentioned in my article TA-65 Telomere Activation and Right to Healthcare Choice, the corrupt FDA ruled this year that pyridoxamine can’t be sold in the US despite the evidence that pyridoxamine helps block AGE (advanced glycation endproducts) damage, that it is commonly found in common foods including fish and poultry products, and that it is also effective at reducing glycation damage in diabetics such as diabetic neuropathy. The FDA did this so that a drug maker can introduce a big-money drug for treating diabetic neuropathy with pyridoxamine in a few years (yes, this is really the reason!). So I’ve switched to the pyridoxal 5 phosphate (P5P) form as it is reputed to have similar AGE-inhibiting properties to pyridoxamine. As Life Extension has done with some of its product formulations that included 50 mg of pyridoxamine, I have substituted 100 mg of P5P in its place. I have also increased my intake of L-carnosine and benfotiamine, both anti-AGE substances with good substantiation from research. I also get supplemental selenium and molybdenum from multivitamins and other supplements that include selenium. While the amount of selenium I consume is more than the 400 mcg “upper limit” advised by the US government, my blood testing shows that my selenium levels are safe. There is no specified upper safe limit for NAC. Rat studies using 1000 mg of NAC per kilogram of rat body weight per day for several months found no evident adverse effects in behavior, liver, kidney, and blood tests. Rats were also found to have a NAC LD50 dosage (lethal dosage for 50% of population) of upwards of 5000 mg per kilogram. If those figures are translated to a 50 kilogram (110 pound) adult, if would be 250,000 mg per day (about 25% of my 1000 gram container of N-acetylcysteine!) to kill somebody or 50,000 mg per day (5% of the container) with no adverse effects. I can’t imagine that anybody could consume this much NAC in such a short time unless they were forcibly fed. Moreover, there are certainly a lot of other more commonly ingested substances (take Tylenol for one!) that would kill a person at far lower doses. If you compute the recommended amounts of NAC for acetominophen overdose treatment for a 165 pound (75 kilogram) person based upon the quote above or this additional information on the use of NAC and Mucomyst for treating acetominophen poisoning on drugs.com, you get 10,500 mg of NAC for initial loading and 5,250 mg of NAC every four hours for 3 days. That’s a lot of NAC, far more than any long-term study I’ve read. I’m surprised they don’t mention the need for vitamin C and B6. But my morbid opinion of the motivation for many drug companies and the FDA tells me that these overdosage treatment guides are probably written by the same pharmeceutical companies who would make more money if you overdose on products containing acetominophen and then need the antidote which they conveniently sell. These large doses of NAC for acetominophen poisoning can produce nausea, vomiting, rashes, and other adverse health effects. But those are common side effects for a lot of medicines. In any case, throwing up and getting a rash is still better than being dead from the Tylenol overdose. If you consider these upper levels of short-term daily consumption that are used for acetominophen poisoning, you see that they are in excess of 30,000 mg for a 75kg person spread with doses four hours apart. Studies such as Clinical pharmacokinetics of N-acetylcysteine show that peak plasma concentrations from oral NAC show up around 1 to 2 hours after ingestion. Given this and the acetominophen overdose protocol, spacing NAC dosages at least 4 hours apart seems prudent. NAC dosages of up to 1200 mg per day are considered safe for long-term usage. 3000 mg is being used in trichotillomania and OCD research. Amounts up to 8000 mg per day have been tested for HIV patients with no significant harmful effects reported. Obviously the acetominophen overdose protocol uses vastly more than that, but for short periods of time. I haven’t seen any strong evidence for problems with NAC aside from annoying but not dangerous digestive problems until you get beyond the 8000 mg per day level used in some AIDS studies. However, it would probably be wise to take no more than 1200 mg at any one time, to spread out your daily consumption over two or more doses per day, and to be sure to take the vitamin C, B6, selenium, and molybdenum mentioned. While taking NAC capsules for almost two years, I was quite comfortable with my usage of NAC at 1200 mg per day with 2400 mg per day peak for up to a few weeks at a time. I would generally take only one 600 mg capsule at a time and space them out a few hours apart from when I wake up to when I go to sleep. With the powder, generally I take two doses with one after waking up and one before going to sleep. If I were to take more than 2000 mg per day (something I haven’t done with the bulk powder yet), I would add a third dose mid-day. The following isn’t a comprehensive list by any means, but may give you some ideas of health conditions for which NAC may be beneficial. Some research suggests that that NAC can lower lipoprotein A and homocysteine levels. Lipoprotein A, abbreviated Lp(a), and homocysteine are thought to be more reliable markers for cardiovascular disease than cholesterol levels are. Dietary changes and common cholesterol drugs such as statins do not have this effect on Lp(a), while there are other options for reducing homocysteine including folic acid, vitamin B12, TMG (trimethylglyine), and choline treatment. See the studies Lipoprotein(a) reduction by N-acetylcysteine and Effects of folic acid and N-acetylcysteine on plasma homocysteine levels and endothelial function in patients with coronary artery disease for more information. Also see the study N-acetylcysteine treatment lowers plasma homocysteine but not serum lipoprotein(a) levels which confirms the ability of NAC to lower homocysteine but shows it did not lower Lp(a). Some researchers suspect that elevated Lp(a) may be linked to abnormal blood clots such as DVT (deep vein thrombosis), so in theory NAC might help reduce clotting risk in people with hypercoaguable blood such as those who have had to take warfarin, Plavix, and other anticoagulation drugs. The research in this area is not well-developed yet, however. NAC appears to improve blood lipid and glucose profiles in high-sucrose fed rats. See N-Acetylcysteine an Allium plant compound improves high-sucrose diet-induced obesity and related effects and Effects of N-acetylcysteine on sucrose-rich diet-induced hyperglycaemia, dyslipidemia and oxidative stress in rats for more information. NAC appears to inhibit LDL cholesterol oxidation that makes the LDL more able to damage the heart and blood vessels. It also appears to reduce the risk of development of NAFLD (Non-Alcoholic Fatty Liver Disease), a common health disorder that is often tied to diabetes and obesity. See Oral administration of S-nitroso-N-acetylcysteine prevents the onset of non alcoholic fatty liver disease in rats and Effects of N-acetylcysteine on alcohol abstinence and alcohol-induced adverse effects in rats for more information. NAC can reduce damage to the body from carbon monoxide exposure. A cocktail of nutrients including NAC, vitamin C, selenium, garlic, vitamin B12, folic acid, dimethlyglycine, zinc, and CoQ10 show promise for preventing some people infected with HIV from developing full-blown AIDS for years. See Nutrients and HIV: Part Three – N-Acetylcysteine, Alpha-Lipoic Acid, L-Glutamine, and L-Carnitine for more information. Finally, for those people who are interested in “blood type diets”, one of the advocates of these diets is Dr. Peter J. D’Adamo. He argues that excess mucus production is a common problem caused by inappropriate diet for people with type A blood. He believes that people with type A blood are particularly prone to mucus production when consuming dairy products. It is very plausible there is a significant correlation between genetic characteristics such as blood type and other genetic characteristics related to diet and the way proteins and carbohydrates interact. However, I’m not convinced that knowing blood type alone is enough information to fully differentiate between the foods that are helpful, neutral, and harmful for each person. But this overly simplistic idea does essentially have merit, Dr. D’Adamo seems to recognize that the situation may be more complicated than blood type alone can cover and is working on improving his theories, and the current blood type diets could be used to provide a starting list of changes to try to improve health. As the dairy/mucus connection is a commonly cited one, it seems prudent to point out again that NAC helps break up mucus and in fact is the active ingredient in Mucomyst, a drug product designed to do exactly that. Consequently, NAC may be helpful for some people with problems with excessive mucus production. So it’s not surprising that Dr. D’Adamo incorporated NAC into a product for people with type A blood called Deflect A that includes 50 mg of NAC per capsule with 4 to 6 capsules recommended per day, for 200 mg to 300 mg of NAC per day. If you’ve got problems with excess mucus production, you should further investigate mucolytic agents such as NAC. If you also have type A blood, you might want to look into both Dr. D’Adamo’s blood type diet theories to see if you can find other ideas on dietary changes that might help the condition. Hi, I want to ask a question. I have read that its not recommended to take multivitamins while taking NAC, alpha lipoic acid, selenium, and vitamin C for skin whitening purposes. As you know the above combination increases glutathione level in the body. Can you please explain? Thanks! I’m not familiar with using NAC for skin whitening. Although I use NAC myself along with the other nutrients you mentioned, I have not noticed any changes in my skin color. I suppose it’s possible such changes are so gradual that I may not have noticed, but it has been years and nobody has commented on me looking pale, fair-skinned, or anything like that. NAC is a great nutrient for many reasons. It’s helpful for mercury and heavy metal detoxification, helps keep the liver healthy, boosts levels of the important glutathione antioxidant throughout the body, helps break up mucus and boost the immune system which are both helpful to prevent and resolve respiratory infections, and prevents damage to the liver and kidney from acetaminophen (Tylenol). In short, I think NAC is something that nearly every adult should be taking at 600mg or more per day given all these benefits. But I also think that a daily multivitamin is very low cost assurance of getting at least a nominal level of many important trace nutrients, too. So I’m skeptical of avoiding a multivitamin even if it were to help achieve a desired skin whitening effect. Possibly there is some ingredient of the multivitamin that interferes with the skin whitening effect, if there is one. But although I’ve done a little searching for an answer to respond to you, I haven’t found any clue of what that ingredient could be. Interestingly, I did find a product Greenwhite Glutathione Skin Whitening Pills that mentions having many of the nutrients commonly found in multivitamins, including iron. Iron was the one nutrient that I was guessing might darken the skin in some people as when it builds up in high levels, such as in the disease hemochromatosis, the skin color can turn more bronze, gray, yellow, or brown. It’s important to do a little research on any supplement you take as pretty much all of them have some potential side effect for at least a few people and those side effects are often not mentioned, possibly because they are not common. For instance, with NAC one thing to watch out for is that there is a chance that NAC may block some of the effect of insulin and therefore could cause trouble for diabetics. As many diabetics are typically testing their glucose levels daily, it should be relatively easy for them to detect if starting or increasing NAC supplementation has any such effect as it would likely show up in their daily glucose test results. If you’re diabetic, I’d strongly recommend that you start with a very low dosage of NAC (perhaps 300mg per day or less) and watch your glucose tests very carefully to see if there is any side effect for you. Definitely do not jump into taking NAC at 2400mg or 3000mg per day like is being used for some studies for OCD and trichotillomania. NAC should be taken with antioxidants such as vitamin C and ALA (Alpha Lipoic Acid) in part because it tends to oxidize in the body otherwise and this could cause kidney stones which can be very painful. Many recommend taking 2 to 3 times the amount of vitamin C as NAC. Some people can’t tolerate high doses of vitamin C or have trouble swallowing the large vitamin C tablets. At high doses, probably the most common side effect is digestive discomfort or diarrhea. Try to take at least the amount of vitamin C as you’re taking of NAC plus add reasonable levels of some other antioxidants, too. ALA is a good choice because ALA helps to “recycle” antioxidants in the body, so it can help keep the vitamin C active to prevent oxidization of the NAC. Selenium, molybdenum, and zinc are also important to take with NAC. These are often found in multivitamins, thus I’m not clear on why multivitamins should be avoided for skin whitening. One caution is that you can overdo it with selenium and zinc. Both can become toxic or worsen health if you take too much. Zinc is particularly problematic because so many supplements contain dosages of around 5mg to 25mg of zinc and if you take many supplements it is easy to end up with more than 100mg per day which is probably going to hurt your health. It does this in part by displacing copper in the body. I’d suggest trying to keep zinc in your supplements to less than 50mg per day and if you can’t do that for some reason to supplement with a small amount of additional copper, perhaps 2mg to 3mg per day. Remember to count the copper that you get from supplements like chlorophyllin as they contain a small amount and many people taking NAC for heavy metal detox are also using chlorella, chlorophyll, and/or chlorophyllin supplements. You can get significant amounts of selenium from a variety of sources in food. One of the best sources is the Brazil nut, each one is thought to typically contain about 50mcg of selenium. Consuming more than 400mcg of selenium per day on a consistent basis starts to risk selenium toxicity, but this can be monitored by blood tests if there’s a concern. Other supplements that may help raise glutathione levels including methyl donors such as choline, DMG (dimethylglycine), TMG (trimethylglycine), and MSM (methylsulfonylmethane). It’s my understanding that it would be hard to overdo it with any of these. The methyl donors (along with folate, vitamin B2, vitamin B6, and vitamin B12) are also very helpful for reducing homocysteine levels which will help your cardiovascular health. Vitamins B2, B12, and pycnogenol may also help increase glutathione levels, too. Vitamin E (which is another antioxidant) is also sometimes recommended for use with NAC, too. I’d suggest that you supplement with mixed tocopherol vitamin E as there is evidence that using only the alpha tocopherol form, the type which is most common in the supplements you find in stores (Costco, drug store, etc. ), may actually harm your health. That’s because it displaces gamma tocopherol from inside cells and thereby worsens the antioxidant situation inside the cells as alpha tocopherol does not protect against the same free radicals as gamma tocopherol does. Just because something is called an antioxidant doesn’t mean it works the same as any other antioxidant — each one of them tends to be better at protecting against certain types of free radicals and worse at others. For reference regarding the experiences other people are having with NAC supplementation, there’s a discussion thread Trichotillomania (Hair Pulling) Support Group in which some of the folks are discussing NAC in the context of trichotillomania and one of them mentions starting NAC without the vitamin C and getting a very painful kidney stone as a result. There’s also another thread on that site with more information on NAC and how it has helped many people (but not all) with trichotillomania quickly. While that’s not your intended use, there some good information there and many of our readers coming to this page are interested in solving their hair pulling problems. Some who are reading this may wonder why take NAC rather than glutathione when the intended effect is to raise glutathione levels. While glutathione is an excellent antioxidant and research shows it may help prevent cancer and other illnesses by reducing the oxidative damage to cells in the body, it unfortunately isn’t absorbed well in the human digestive tract. NAC contains cysteine, part of the larger glutathione amino acid, and it is in a form that can be readily absorbed.